Australia’s flag was officially raised for the first time on 3rd September 1901 at the Royal Exhibition Buildings, Melbourne. The design was the product of a competition held to find a national flag for the newly federated Australian nation. The competition attracted 32, 832 entries from Australia and overseas and five individuals shared the honour of submitting the winning design. Apart from a few minor differences in the magnitude and number of points on the stars these people had designed what we know as the Australian National Flag. The Australian flag was called the Australian or Commonwealth Blue Ensign until the Flags Act of 1953 gave it the title of Australian National Flag confirming it as the chief national symbol by law, custom and tradition. The continuity of the Australian National Flag can be traced back to 3 September 1901, the day it was unveiled, in the presence of Australia’s first Prime Minister, Edmund Barton. This fact was recognised in 1996 when the Governor-General, Sir William Deane, proclaimed 3 September “Australian National Flag Day”. Click here to view a copy of this proclamation. There are critics of the Australian National Flag who have argued that the design of the flag should be changed to one which does not feature the Union Jack. 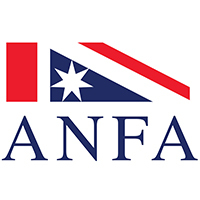 The Australian National Flag Association (ANFA) believes that the existing design is an integral part of the Australian heritage and an appropriate expression of our national identity. The existing design of stars and crosses should therefore be retained and not altered in any manner whatsoever. As a resource for anyone debating this issue we have complied a list of arguments that are sometimes put forward by critics of the Australian National Flag. These arguments for change are unsound as evidenced by the following rebuttals. Australia should be a republic and therefore needs a new flag. The question of a republic is irrelevant to the design of the Australian National Flag. The Flags Amendment Act 1998 places the authority to change the design of the Australian National Flag firmly in the hands of the Australian people who own and are represented by it. Our flag was democratically chosen through a public competition in 1901 and only the Australian people have the right to change it. It is a colonial flag that signifies our subordination to Britain. Although Australia was once a collection of six separate British colonies, this is no longer the case. 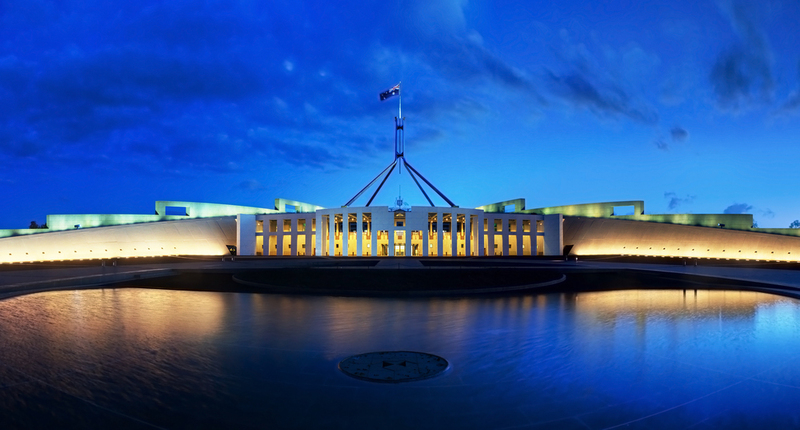 The creation of the Australian Federation on 1 January 1901, the Statute of Westminster Act in 1942, and the proclamation of the Australia Act in 1986 make it quite clear that the British Parliament no longer has authority over our independent and sovereign nation. The Australian National Flag is unambiguously democratic in its origins as it is the product of an open public competition. 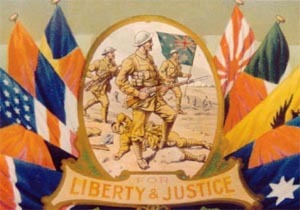 The Union Jack represents the principles on which Australia’s unique style of liberal democracy is based. The Australian National Flag stands for freedom of speech, parliamentary democracy, rule of law, egalitarianism and the courage and sacrifice of the ANZACS. It also represents our geographic position in the southern hemisphere with the Southern Cross while the Commonwealth Star represents Australia’s federation of States and Territories. The Australian National Flag is a positive reflection of the values and ideals that have been the bedrock of a society and a system of Government that are among the most envied in the world. The Design was imposed on us by the British Government. The rules of the 1901 flag competition made it compulsory for entries to include the Union Jack. It has been argued that the 1901 flag competition was undemocratic because entrants were expressly told to include the Union Jack in their flag designs. In fact, neither the rules of the Government competition, nor the Review of Reviews’ competition whose entries were included in the Government competition, specifically asked for the Union Jack to be used as a condition of entry. “be based on the British ensigns … signalling to the beholder that it is an Imperial union ensign of the British Empire”. There was no such competition rule. This error stems from Gwen Swinburne’s 1969 book, Unfurled: Australia’s Flag, in which she incorrectly attributes the above quote as a condition for the 1901 flag competition. She had apparently used a passage from Barlow Cumberland’s 1909 book, History of the Union Jack and the Flag of the Empire, as the basis of her quote. The evidence is clear – there were no official conditions placed on entry in the 1901 Flag Competition. The Canadians changed their flag in 1965, why don’t we do the same? The circumstances which existed in Canada were, and still are, totally different from those applying in Australia. It must be remembered that Canada was founded after wars between the British and the French, culminating in the defeat of the French in 1759. However, a vocal French speaking minority remained and in the 1960s they threatened to withdraw Quebec from the Canadian Confederation. Since 1867, Canada had used a maritime flag as a defacto national flag. It was a red ensign with Union Jack and Provincial (State) emblems. It was not until 1965 that the Canadian Government, under Prime Minister Lester Pearson, established the first “Canadian National Flag”. This was an attempt to appease French Canadians. Thus, unlike the Australian flag, the maple leaf flag was chosen by a Government appointed Committee rather than by a democratic public competition. Today many French speaking Canadians regard the Canadian National Flag as the flag of English speaking Canadians. When Australians go overseas, nobody recognises our flag. The Sydney 2000 Olympic and Paralympic games resulted in the Australian National Flag being proudly and enthusiastically waved before an estimated television audience of 3 billion viewers. This international exposure has dramatically increased knowledge and recognition of Australia and its flag. Now that the Australian National Flag is over 100 years old and has been placed centre stage on the world arena, it is one of the most easily recognised and respected flags of the world. Over the last 100 years Australia’s flag has travelled to many locations around the world in the custody of our soldiers during war and conflict. Every day French school children at towns and villages along the Western Front still raise the Australian flag as a tribute to the ‘diggers’ who died liberating their homes during WW1. A proud moment for Australia and for Flag bearer and Olympian Andrew Gaze as he acknowledges the crowd at the opening ceremony of the Sydney 2000 Olympics. Photo Courtesy of Mr Hans Dirck. Many national flags are tricolour or bicolour designs (stripes) which to many are indistinguishable from one another. After all it is not of vital importance that people from other countries continue to instantly recognise our flag, what really matters is that individual Australians can recognise and understand the importance and significance of their national flag of “Stars and Crosses”. The Australian National Flag is very similar to the New Zealand flag. It is not surprising that some countries share common flag devices and designs to denote their common history and/or geographic position. This is the case with Australia and New Zealand situated in the Southern Hemisphere, represented by the Southern Cross, and sharing a common European origin (Union Jack). Such similarities are consequently a very weak argument for change. The New Zealand flag features four red stars with white borders whereas the Australian flag features six white stars. Below are some examples of other national flags which share similar characteristics. The similarities between the New Zealand and Australian flags does not in any way necessitate the adoption of a new Australian flag nor does it detract in any way from the pride and positive feelings that Australian citizens have for their national flag. Should the Aboriginal flag be our national flag? The Aboriginal flag was designed in 1971 by Mr Harold Thomas, an elder from the Northern Territory, and he personally was recognised by the Federal Court as the owner of the copyright for this design. It is not right that those of non-Aboriginal heritage should appropriate their distinctive flag. The flag represents the Aboriginal people of Australia, and their unique and ancient culture while the Australian National Flag represents all Australians and their common traditions and beliefs. Are there any Aboriginal connections to the Australian flag? Aborigines are first and foremost Australian citizens and our national flag symbolises universal justice and freedom for all our people. It is also worth noting that the Southern Cross, which features prominently on the national flag, was known to ancient aborigines and is mentioned in a number of their timeless legends including the story of Mululu and his four daughters. The flag doesn’t reflect our multicultural society. This is a confused argument that is insulting to individuals who have migrated to Australia. The fact is that most migrants are loyal and patriotic Australians who have come here voluntarily for the freedom enshrined in our social institutions. They honour and respect the flag. No flag represents all the cultural and ethnic groups in a society. America has probably more cultural groups than any other country, but they are united behind the “Stars and Stripes”. Their flag represents Americans from all backgrounds without using individual devices for each cultural group. The Australian National Flag is reflective of Australia because it stands for the values and ideals that underlie our society. These can be understood to include freedom of speech, parliamentary democracy, rule of law, egalitarianism and the courage and sacrifice of the ANZACS. These things have a meaning and relevance that extends to all Australians irrespective of their ethnic background or country of birth. It is clearly the responsibility of new arrivals as it is of all Australians to pledge loyalty to the Flag, to honour it, to respect it, to understand its history and traditions and what it stands for. The colours of our flag are out of line with our national colours, therefore we should change our flag to bring it in line. For many years green and gold had been used as our “national sporting colours”. When they were proclaimed “national colours” in 1984, nobody questioned what the previous colours had been and never equated such “national colours” as pertaining to the colours of the national flag. This attempt at colour co-ordination is as spurious now as it ever was. We didn’t have a national flag until the Menzies Flag Act of 1953. Our Australian National Flag was selected from those submitted by 32,000 Australians in a competition soon after Federation in 1901. At that time Australia became a new nation, a united nation, with a new identity ready to face the challenges of a new country. “One people, one flag” was the catch cry of the times. Our national flag was first raised on 3 September 1901 and from that time forward it has been associated with all of Australia’s achievements on the international scene, such as every Olympic games since 1908. Australians fought under the flag and wrote it into Australian history and legend as evidenced by the pride of the ANZACS. The Menzies Flag Act of 1953 merely clarified that Australia’s National Flag was in fact the Blue Ensign while the Red Ensign was to be flown at sea by Australian commercial ships. Australians never went to war under the National Flag but under the Union Jack. Our National Flag has been the rally point for both the Armed Services and the civilian population in all wars in which Australia has participated this century. Evidence of this can be seen in the ANZAC BOOK, by the famous historian C.E.W. Bean where a coloured photo can be found of an Australian Digger standing alongside the Australian Flag at Gallipoli in 1915. Other photographic evidence of the national flag being used to represent Australians at war can be found in the Australian War Memorial with such historic photos as the Flag being raised at Pozieres (1917) and Kokoda after re-capture from the Japanese. There is also a photograph of Sgt. Derrick hoisting the Flag at Sattelberg (1943) and of the Australian National Flag being raised in Vietnam. 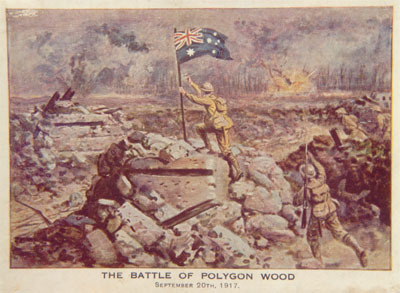 A depiction of a dramatic event that took place during the famous Battle of Polygon Wood (Belgium) during WW1. Since federation more than 1 million Australians have served under the Australian National Flag and 102,000 of these courageous men and women have died defending our national symbol during war and conflict. 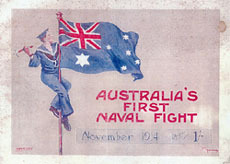 The flag was carried into New Guinea at the outbreak of World War I by the naval and military force which captured the German colonies, by the cruiser Sydney in the first naval battle of the war, by the ANZACs who landed at Gallipoli and by the “diggers” who spearheaded the victories in France in 1917-18. . . When Singapore was retaken in 1945, the first flag to fly was an Australian ensign made secretly in a prison camp. The incontrovertible fact is that since Federation more than one million Australians have served under the Australian National Flag in our armed forces and 102,000 Australians have died defending our country and the flag that represents it. These three verses of a fourteen verse poem, ‘We’re all Australians Now’ by Banjo Paterson were published in 1915 (during WWI) as an open letter to Australian troops. Note the reference to HMAS Sydney flying the Australian Flag at the masthead while defeating the German warship SMS Emden. Their trade on foreign seas. November 1914, HMAS Sydney flies the Australian flag during her victory over German warship SMS Emden. All Royal Australian Navy warships have flown the National Flag since its formation in 1911.